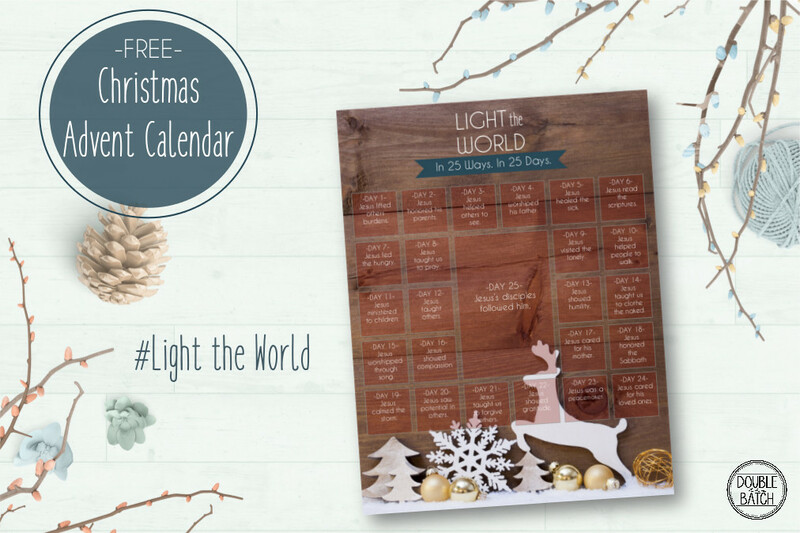 This Christmas, gather the whole family in a month of service and love through a 25 day Christmas advent calendar to “Light the World”. Each day highlights a way in which we can spread the light of Christ this Christmas season through his example of service and love. 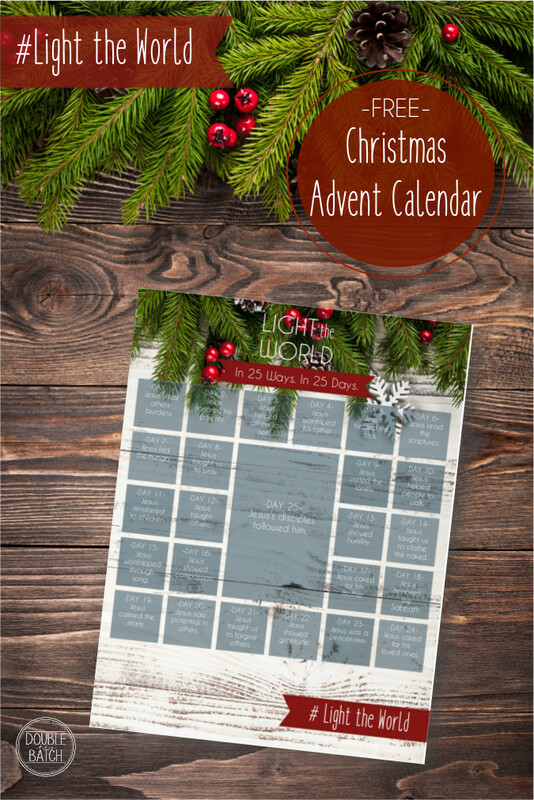 Choose from 2 free advent styles! Christmas is hands down my favorite holiday. There is a special feeling during December (and even some of November!) that makes me want to smile. It’s not uncommon to encounter wonderful acts of kindness and service throughout the month. These acts of kindness might come through a neighbor, loved one, or even a stranger. This worldwide pull on humanity to spread joy and love throughout this time is a beautiful thing. Christmas is a time in which we celebrate the birth of Christ and reflect on his teachings and example throughout his life. Jesus Christ is the Light of the world! 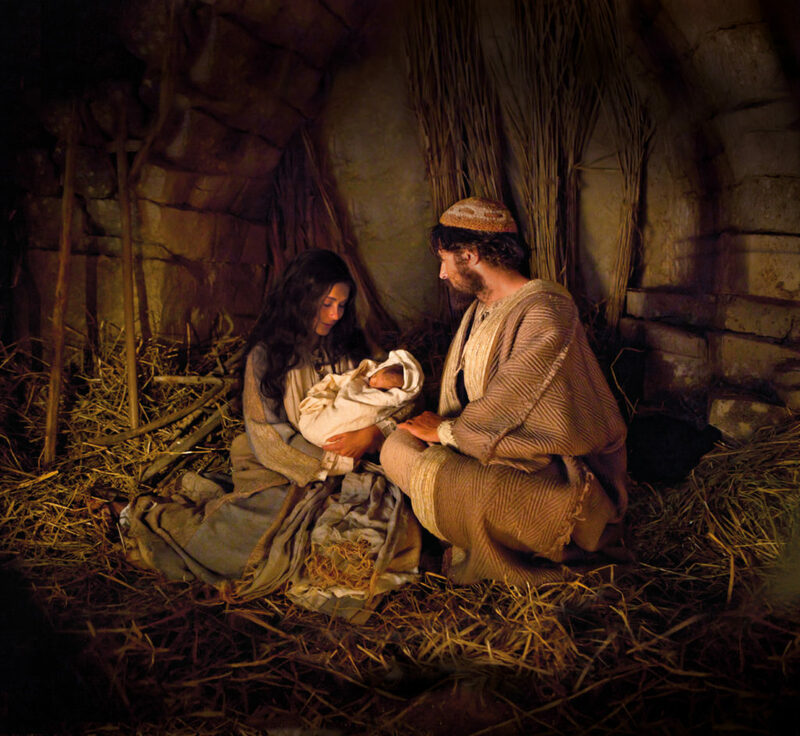 Christmas is a wonderful time in which we can share this light through our own actions by doing the things he did. 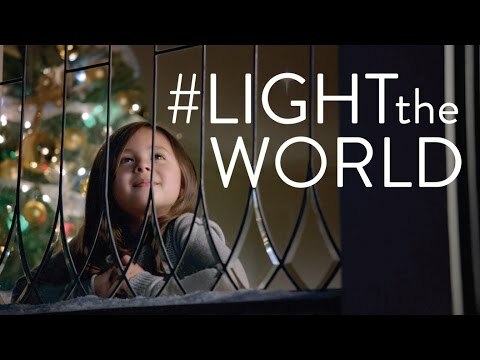 The Church of Jesus Christ of Latter Day Saints has created a campaign to “Light the World, in 25 ways in 25 days“. To promote this initiative, they’ve created a calendar that highlights 25 different Christlike behaviors that we can emulate in the 25 days leading up to Christmas. Each day will have suggestions for different service opportunities your family could participate in. Day one of the calendar starts with a kick off activity in which everyone is invited to participate in a Worldwide Day of Service. Help a loved one, a neighbor, or even a complete stranger. Whether your acts of service are creative or simple, you can share your stories of giving and receiving online with the hashtag #LIGHTtheWORLD. 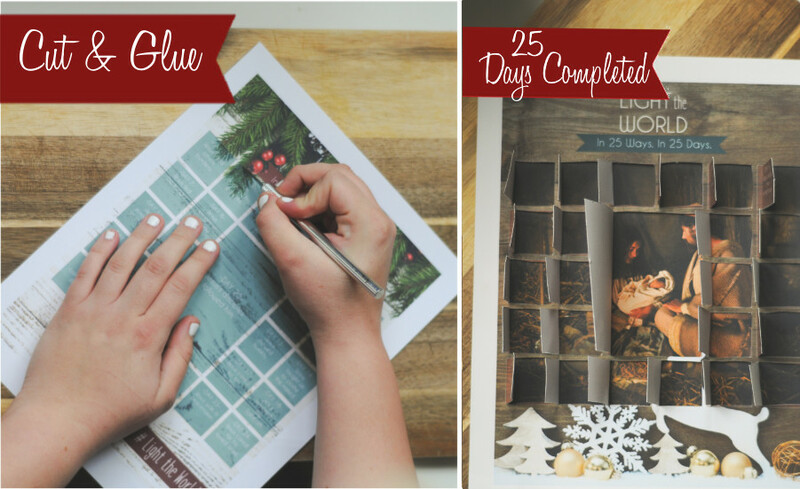 To accompany the 25 days of service calendar, I’ve created a fun classic advent calendar that your family can open every day. Each day your family can complete the corresponding act of service and will reveal a part of an image hidden beneath the calendar. On the 25th day the entire image is shown, revealing the nativity scene pictured below. 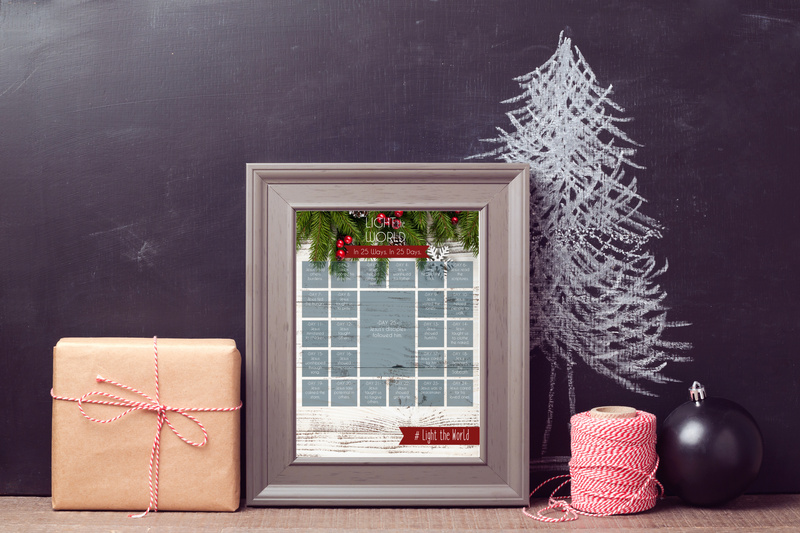 To create your advent calendar, start by choosing one of the two styles offered and click the corresponding download link below. 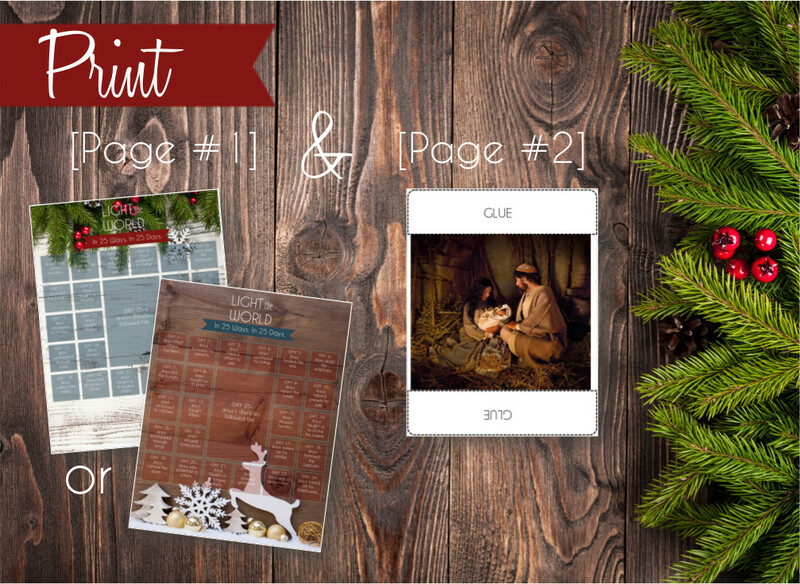 Each download includes two PDF files consisting of the advent image and the inside nativity image. Once downloaded, double click on the file to uncompress it and then print off both PDF files on cardstock. Cut out your advent calendar boxes. I used a sharp scalpel to make my cuts and placed a cutting board beneath my paper. Cut 3 edges of each box EXCEPT a very small piece on the right side of the box. This will keep the box from opening too soon. When that box is opened, you will simply tear that remaining connecting piece. Before gluing your pages together, lightly push up on the corners of your boxes from the back to ensure all corners are cut through. This ensures they will be easy to lift open. Add glue to the top and bottom sections stated as well as any white space on the left and right of your nativity image. Once dry, your advent calendar is complete and ready for December! I love the idea of adding service to my families list of fun Christmas activities this year. As a family we look forward to doing acts of service everyday. Even if they are small simple acts, it’s a great way to focus on what is important during this Christmas season.